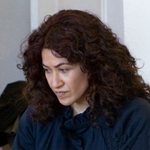 Laleh Mehran is an Assitant Professor in the Electronic Media Arts & Design department of the School of Art and Art History at the University of Denver. Mehran’s research areas include the intersections of art and science, media politics, and emerging forms of time-based media. Her work has been shown individually and as part of art collectives at the Next 5 Minutes 4 Tactical Media Festival in Amsterdam, Holland; the European Media Arts Festival in Osnabruck, Germany; Ponte Futura in Cortona Italy; Massachusetts Museum of Contemporary Art in North Adams, MA; the Orlo Video Festival in Portland, Oregon; the Carnegie Museum of Art; The Georgia Museum of Art; The Andy Warhol Museum; and the Pittsburgh Biennial at the Pittsburgh Center for the Arts in Pittsburgh, PA.